Greetings, after the update to android pie in my nokia 5 I decided to do a full factory reset and start the phone like new. Everything went well and I knew I would lose everything in my sd card which was set as internal storage, I backed up everything. After restoring and formatting the SD card to use again as internal storage I noticed that the default storage manager shows both storage, back in 8.1 they were merged as one. I though it was weird but nice. 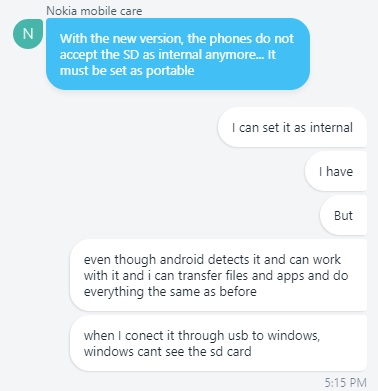 But when I connected the phone through usb to my pc, it showed only the internal storage, not the sd card. 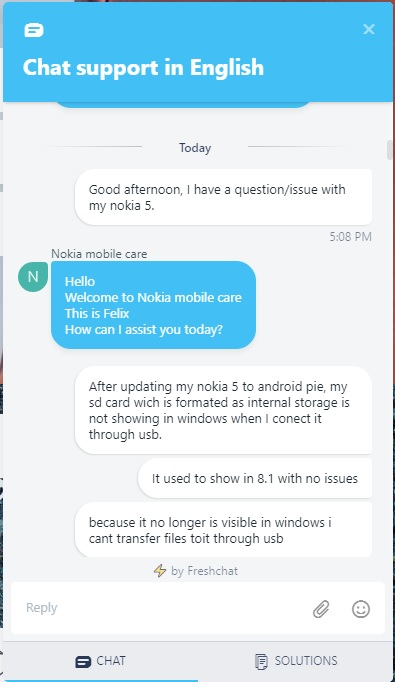 While I was with customer support in the chat, y reformatted twice and set it as external, then internal and finally restarted the phone and now i can see the sd card but not the internal storage. The customer support was awful and I want to share it here because I can`t believe it even after experiencing it. 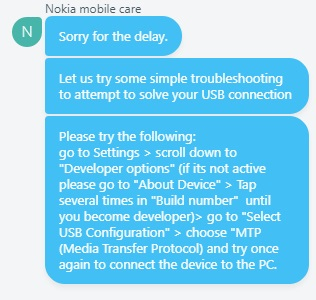 (did not fix the problem). I will be pasting cropped images from the chat, that is the only way I have to copy it fully. Up to this pint everything is ok, but then. Here lies the problem, he is explaining it as if it was 8.1, not 9. At this point I started to worry. Ok maybe he got caught off guard, although pie has been out for a long time on other models. Again this is for 8.1 not 9.0 also mtp does not exist as such in 9.0 now this is annoying and I am not closer to resolving the issue. 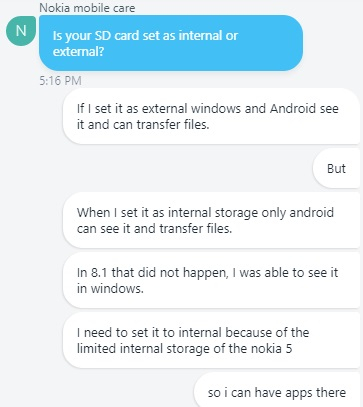 After telling him where those options are in 9.0 and that my problem was ``reversed´´ ( now I can see SD card but not the internal storage after reformatting and restarting the phone). 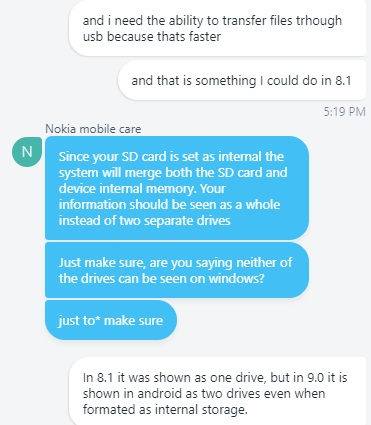 He told me to change the default usb configuration to transfer files which makes no sense because in 9.0 you select that in the quick menu, also selecting file transfer as default is risky for the phone. After that solved nothing, he suggested I reinstall the mtp drivers, I did and of course It did nothing because windows was not the issue. 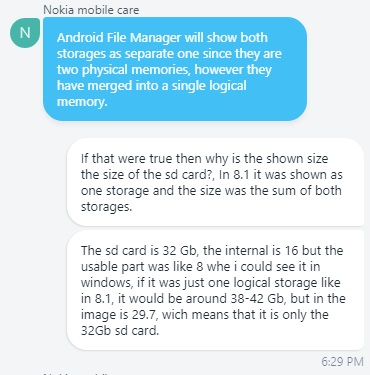 He asked for a screen cap of how windows see the storage. 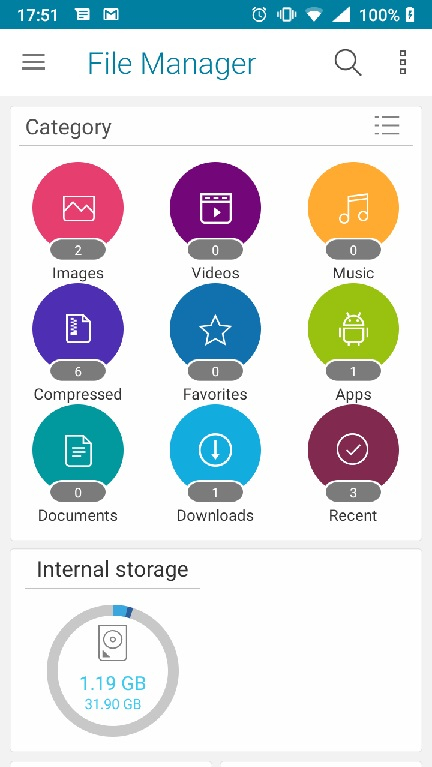 As you can see the internal storage app sees the internal and the sd card fine. 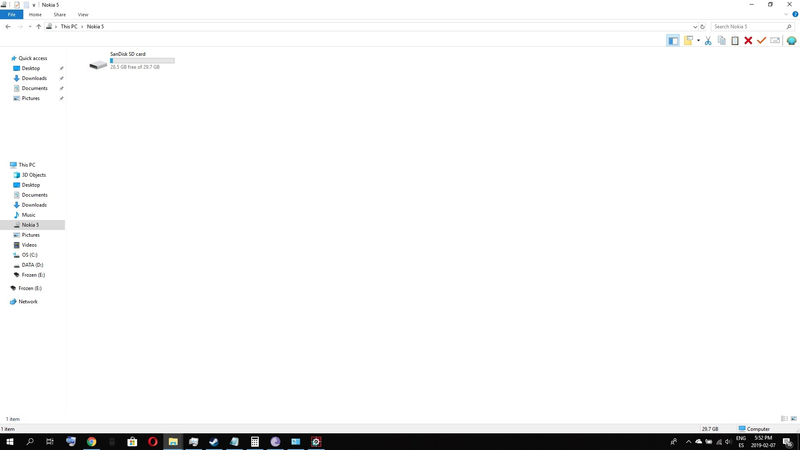 This 3rd party app (asus file manager) has the same issue as windows, which means that android has a problem, not windows. At this point I don`t know If this person understands what I am telling him, but it gets even worse. 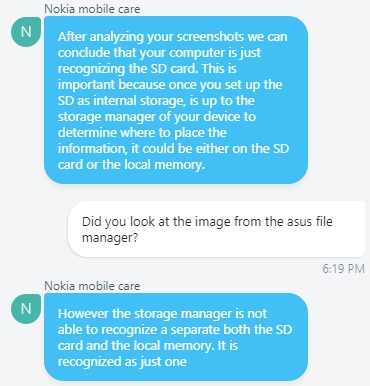 Again he says he ``analyzed´´ the screenshots, maybe that means not looking at them, since you can see that the sd card is being shown to both the file manager and windows, but the internal storage is not. 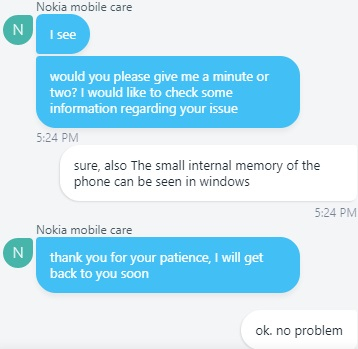 As we can see customer support has absolutely no idea what he is talking about or even has looked at the pictures with attention. 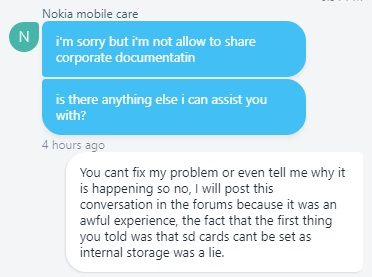 At this point it is obvious customer support doesn't care, the first thing I said was that I needed to set it as internal storage to put apps there, did he even read what I wrote? Also google drive... seriously does he even understand how phones work, and how useful it is to transfer files through a physical cable? 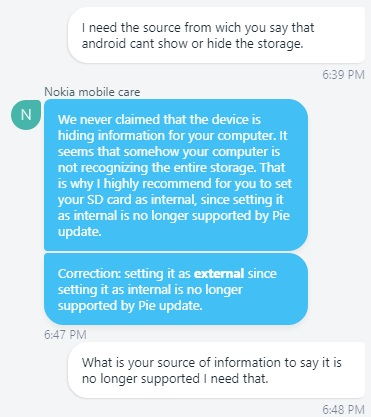 At this point I was equally angry and amazed at how ridiculous this was and then I read again his claim that sd cards as internal storage were not supported in android pie anymore, the after a quick google search turns out that the first result is a post about that problem in an early version on the nokia 6.1... seriously, there is no source, except that, if that was an android limit there would be some results after the search but nothing. So I asked for his source. 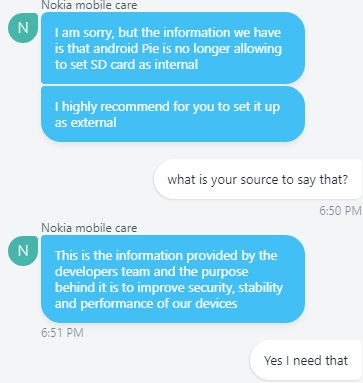 If he is claiming that android pie is not supporting a feature, then the least would be a link to a press release or something that says that no? 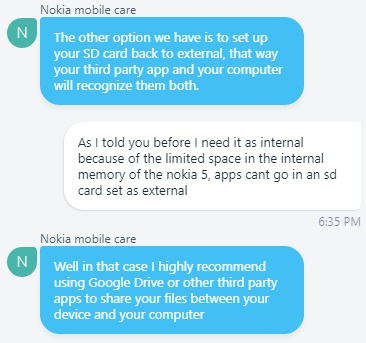 So it seems like he is just pulling the info out of nowhere because he says it is not allowed even though I can do it, and again recommends to set it as external, and if I do that then I have almost no space for apps. And so I am posting this on the forum to show how bad the customer service is in case you need help in the future. Pd: I know itis a very long post even though I trimmed the unimportant parts. This whole adoptable storage in Android is confusing. Even I've not fully managed to understand where it works. As it is more or less missing from all the newer devices made by Nokia (at least). 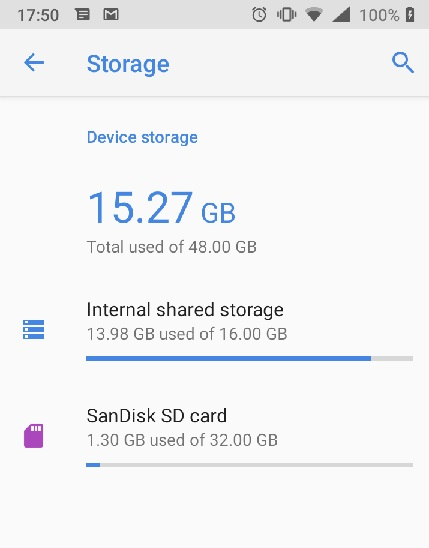 Google seems to be not so happy keeping this legacy feature as SD cards are naturally slower than EMMC and that ends up in a more sluggish smartphone behavior. I'm just surprised that they have still kept the "Format as internal" option for you to use. Then we all know about the quality of chat support. Basically, it is better to search on the internet than interacting with Chat support on any of the technical topics. I won't recommend reaching out to them on any of the technical support topics as all the user will get is disappointment. It is very useful because then I can have apps installed in the sd card, and even if they are slower it is very convenient. I do not need my printer app or netflix to open 2 seconds faster, after they load into ram they work fine. I fixed the issue and made a new discussion for it on the forum. Android however tests the performance of the memory and either shows a warning or refuses to continue if performance is too bad when an internal format is attempted.